Some song on The Current (partial ban, explained at a later date) caught my ear the other day and I had one of those wonderful "driveway moments" that public radio hangs it hat on. I couldn't place the song, and I moved on. Today, out of the blue I realized that the song I was vibing on was what Jeremy Klein had skated to in Hookup's 1994 release Asian Goddess. I went ahead and downloaded said Frank Black song, and then of course, I had to go rip apart my closet in order to find my probably lost copy of Asian Goddess, to, I don't know what I was going to do with it, I don't have a VCR. As could be judged by the above photo, I didn't find the video; instead I realized that I have two copies of Europe '96, and what I'd already known, that I have a really impressive collection of VHS copies of 411's, issues 9 through just about the last one they did on VHS. If you call that impressive that is. I also found the three vids pictured above. Apocalypse: I know Neal and I split a copy of it $5 each when we bought it out of Johnny Vang's backpack at the Lake St. Lair. I got custody of the video Sunday through Wednesday. This may or may not be that copy. I thought Hardflip had Apocalypse for download but the closest thing they've got is the Roots Promo. Unknown Empire: I feel like I have should have a brotherly connection with anyone that knows anything about this video. Its not listed on SkimTheFat, however, I did manage to find Brandon Cardone's part on some random URL. 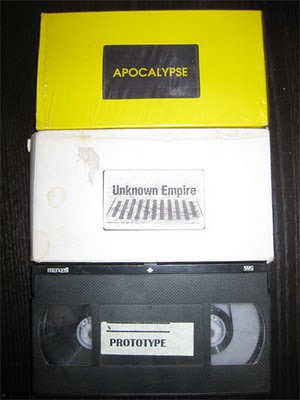 Unknown Empire does deserve some spot in the pantheon of pre-internet indy videos that enjoyed some sort of wider release than it's home area, that being Upstate New York. They're means of getting the word out was multiple commercials in 411 in issues from the mid-teens; they picked the seven best clips from the video and made quite a serviceable ad. Unfortunately, they'd already shown the seven best clips and with inflated expectations, I jumped on the copy above when I saw it at Calsurf, so for the record, both Muldoon and I were suckered. I mean, he ordered it. Prototype: This is the first video jerboi Elijah Collard was involved in. He, pre-trees and pre-Roll, along with Chris Carnahan and Patrick Voller cranked the video out for Mr. So-and-so's class, and I'm ever so happy to still have a copy, oh, 13 years later? Prototype is way less psychedelic than Elijah's later additions to the TC cannon and contains all those mid-90's staples; Guy Mariano Axions (yellow and white only), The Metrodome stages, The Fed, and a dude rapping after the credits. Its all there. And guess what. You can watch it at Mightyroll.com. Happy weekend, and if I ever get a VCR I'll review the Untitled I-Level video that Holtan gave me for my 20th birthday. didn't he skate to Cocteau Twins in asian goddess? Or was that Ravers? Asian Goddess, VCR, and crappy beer at the bowl. Stop by sometime.